Recently Frank Gehry, Norman Foster and many other architects produce buildings with organic surface shapes. In their design process, it is essential to model and render the buildings using 3D CAD systems and CG in order to grasp the shapes. However, Architectural designers tend to like grasping shapes and spaces through physical models in real space. Due to this, an additional process is required to materialize the virtual models into tangible ones. 3D printers are used for the purpose. Although the current 3D printers requires a long hours to output models in many cases. Besides, 3D Printers use plaster or resin to output models, so that it is difficult to quickly modify and redesign them. Our approach is to use smart materials in the process of CAAD(Computer Aided Architecural Design). SMAAD is the abbreviated form of “Smart Material Aided Architectural Design” or “Shape Memory Alloy Aided Architectural Design”. SMAAD Surface is an instance of SMAAD which is implemented as a first prototype. 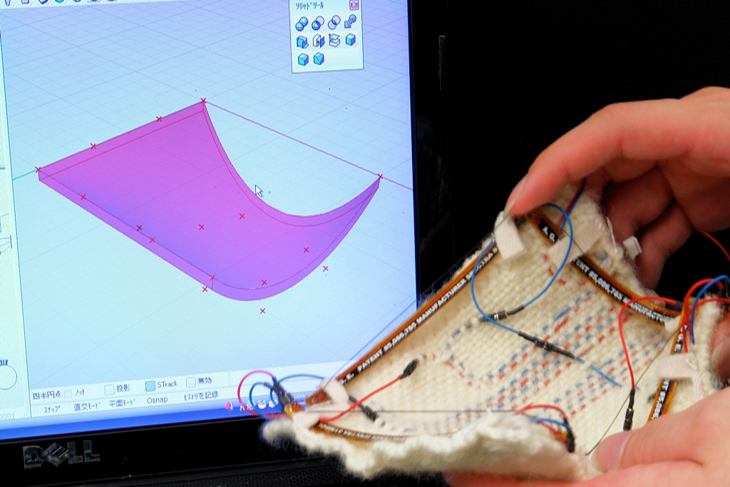 SMAAD Surface is a fabric input/output device that uses fibrous shape memory alloy (SMA). By referencing Surflex (the first programmable surface [Coelho et.al 08]), we have improved the ability to maintain, record and play back arbitrary surface shapes through feed-back loop. 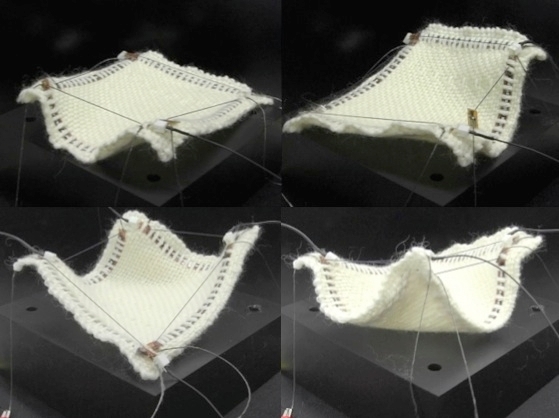 This fabric functions as a smart material and designers can modify its shape through manual operations. As the flex sensor detects the fabric shape and the actuator works to maintain the shape, a designer can model the fabric shape as if he/she manually models a free-form surface. The surface shape is sent to a 3D CAD through a microcontroller and the digital data can be modified in the same manner as the shape of the fabric device. In the same way, if the digital data is modified in the 3D CAD, the command is sent to the fabric device so that the fabric shape can be modified to follow the digital data. The surface shape data sent continuously from the flex sensor is saved as operation history and used for the operation replay. 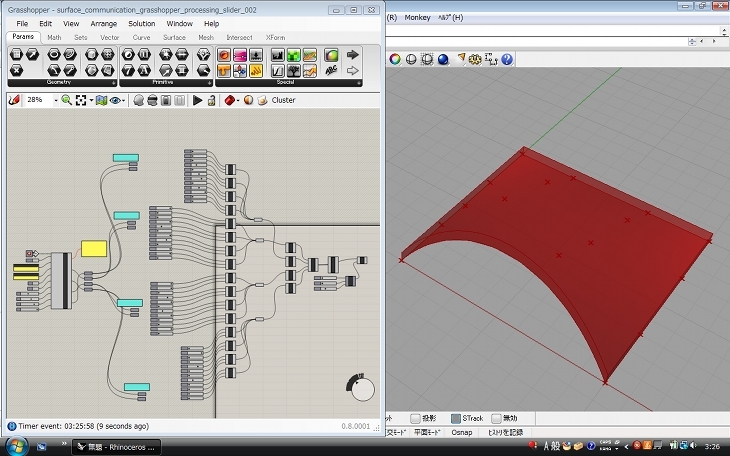 This allows the UNDO/REDO operations of the modeling. With this function, a new function to relive the modeling process may also be realized. The operation history saving and replay are also available as the function to record and reproduce motion design, executed in the two steps below. In the first step, the direct operations sent from the flex sensor are recorded in a certain period of time. In the next step, the recorded motion is applied to SMA in the same period of time to reproduce the motion. This function will be used for the design environment of kinetic architecture such as Hyposurface(Goulthorpe and dECOi, 2000) or The Muscle Projects(Oosterhuis et al., 2008), which are attracting attention in recent years. At present, we succeeded in connecting four fabric devices. In the future, if several dozens of the devices can be connected, it will be possible to actuate versatile shapes. This means that the SMAAD functions as a rapid prototyping system beyond design systems. Ling time to wait for the output from the 3D printer will not be necessary anymore and immediate prototyping will be possible to grasp shapes in a moment.